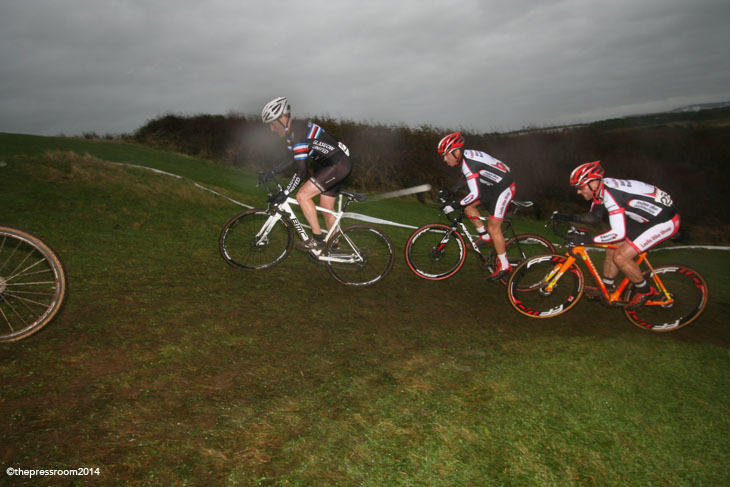 Scottish Cyclocross is not just about the racers pinning a number on and giving it full chunder when the gun goes; it is also the behind the scenes course preparation and organisation that make the events what they are today. In the most challenging of circumstances Neil Walker and his die-hard Walkers Cycling crew battled against every conceivable obstacle to put on what will be remembered as possibly the hardest event that many a 'cross rider can ever expect to clip-in and take a splintering, battering in the dunes and climbs of the Irvine Beach Park venue. 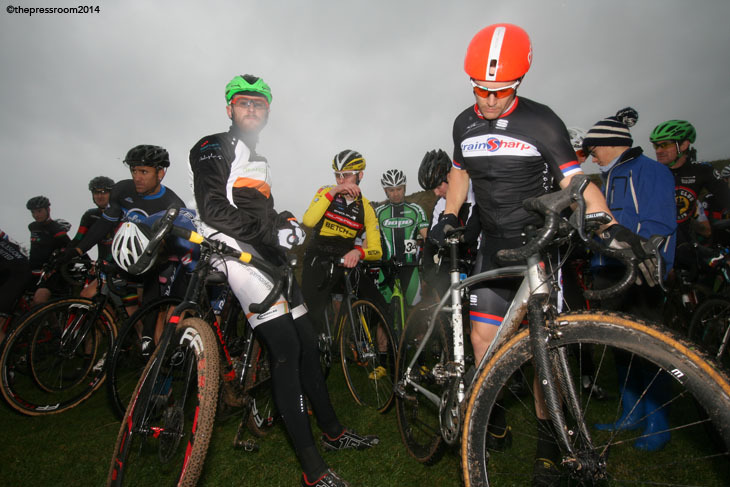 With over 380 riders signed on and ready to battle in the most tempestuous of circumstances, Mother Nature well and truly spat the dummy out and puked rain, hail and gale force winds on all concerned for the duration of the third round of the Ridley Scottish Cyclocross Series. 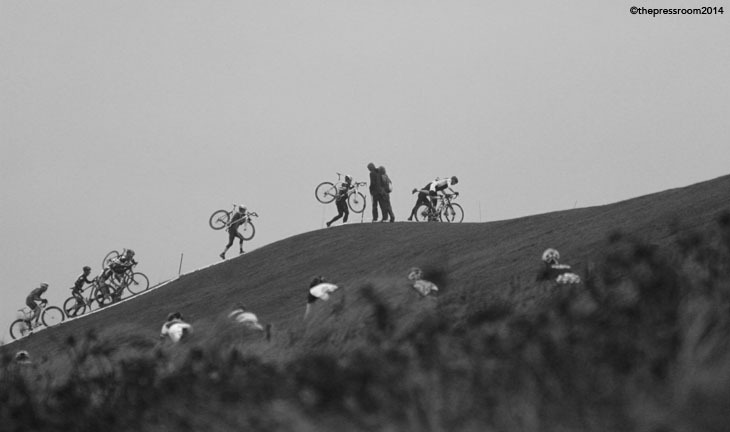 The dunes and slick off-camber sections are normally a test of strength enough for any bike rider, but the sight of racers shot out by the wind and squalor riding gamely into the gully of grimace, hunting to hold a wheel, forced some clever riding and a pack mentality that is very rare in a Cyclocross race. 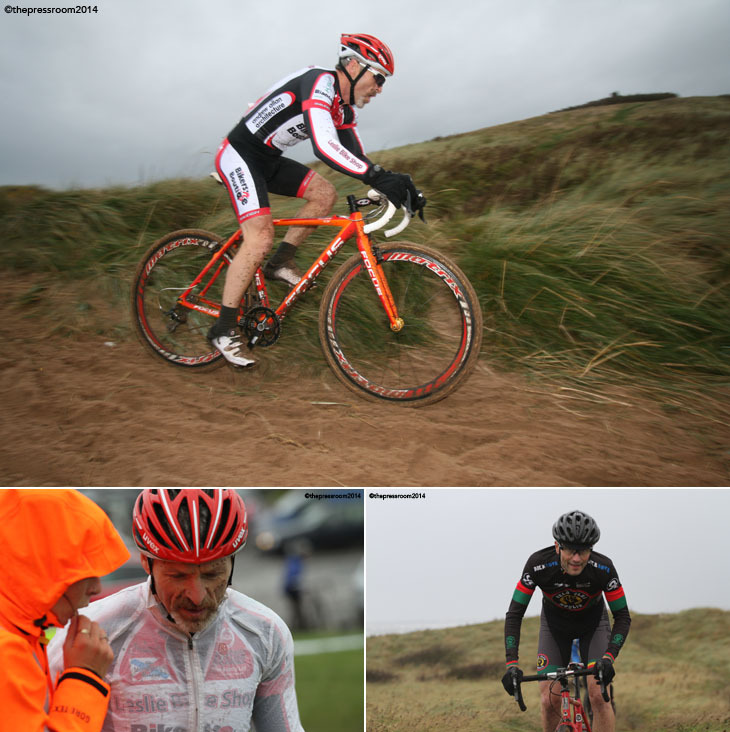 While so many were flailing in the conditions, Scottish Cyclocross fans were treated to the oh-so-rare appearance of British Under 23 Cyclocross Champion Grant Ferguson (Brentjens), who lined up against Series hot shoe Rab Wardell (Orange Monkey Pro Team), James McCallum (trainsharp.co.uk) and a glut of competitors and fancied podium riders in the shape of the gritty Stevie Halsall (VC Moulin) as well as the young guns Calum Magowan (Alpine Bikes) and Harry Johnston (Team Thomsons). 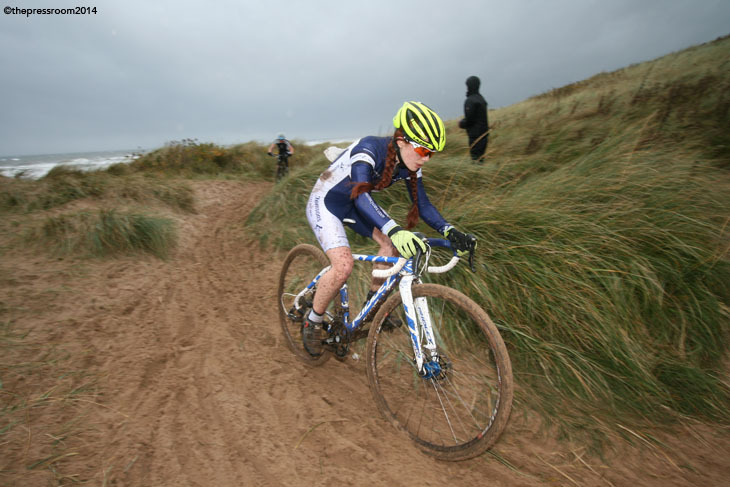 Ferguson, a World Class Mountain Bike rider, was more than happy to take to the sand and a set of curly bars to give the Series regulars a master-class in beaching the opposition in a fraught and trying race. From the get-go, he was joined by an on-form Wardell, and the pair set about ripping the backside out of the race early on. Wardell, who was well aware that grabbing Series points would be key to his race, clung on limpet-like in the early laps until Ferguson decided to drop Wardell's anchor and ride solo in the latter part of the race, sucking up not only his pursuers, but incredibly putting a lap in to all but the remainder of the podium boys by the time the chequered came around. Wardell rolled home in a safe second ahead of Halsall, and a spirited ride from McCallum (last week's Doonside Trofee Winner) who was one of the first to admit the boy Ferguson is simply on another level. 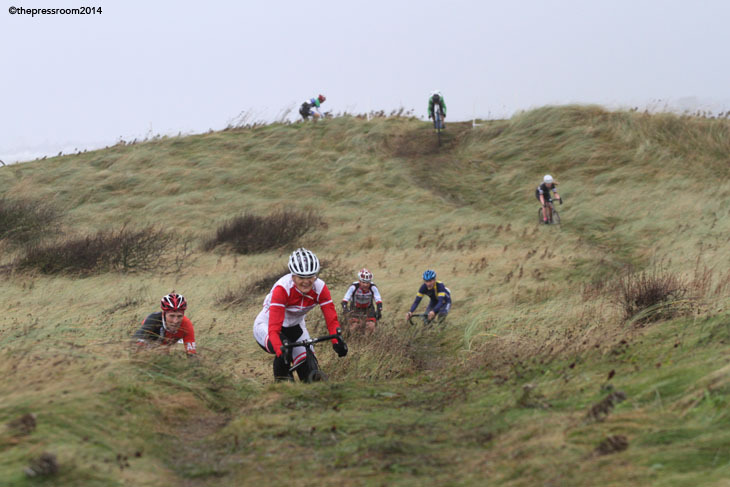 There was the usual ego bashing and chest puffing before the start of the Veteran Forty class, with all of the usual Series riders on-grid, as well as a welcome visit to the dunes from Kevin Ashbridge (V.C Cumbria) to add a little more seasoning to the ninety-strong field. After the usual scrap from the start, Paul McInally (Evans Cycles) managed a full-on effort early doors to lead the main riders up the zig-zag climb, before the full effect of the omnipresent, heaving storm blew the pecking order to smithereens, and soon small cluster groups were forming all the way down the order. 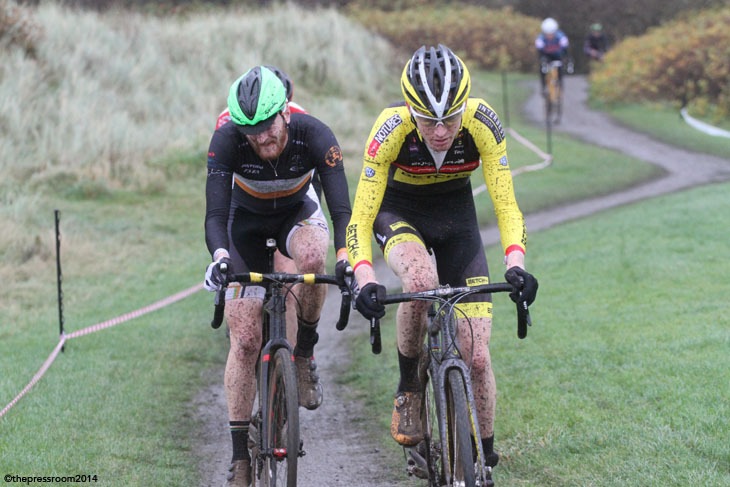 Stevie Jackson (Glasgow United) is well worthy of merit for taking on the race and managed to batter his way to the front of the field in the early laps pursued by the combined efforts of the Leslie Bikeshop/Bikers Boutique squadron, Messrs: McCaffery, Porco, McCrae et al. 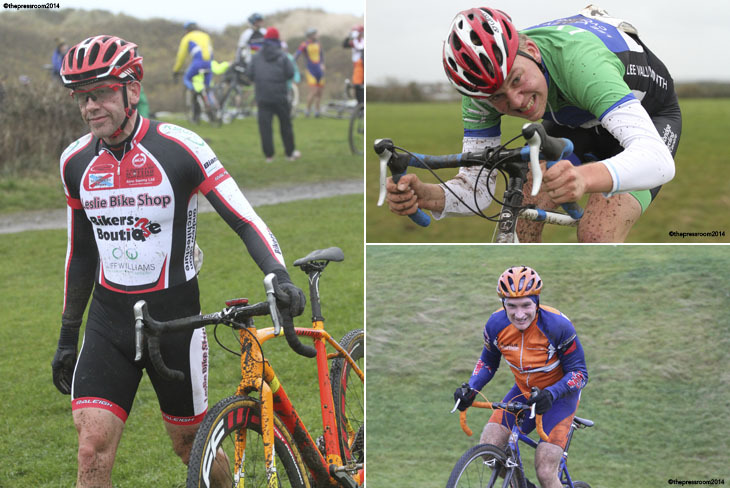 These guys, along with Colin Bain (EKRC) and an impressive Ashbridge, would soon be hurling themselves, but not any abuse, into the midfield flotsam of the race by the time that last lap bell came a-clanging. We're getting used to this sight: Glasgow United and Leslie Bikeshop fighting it out! 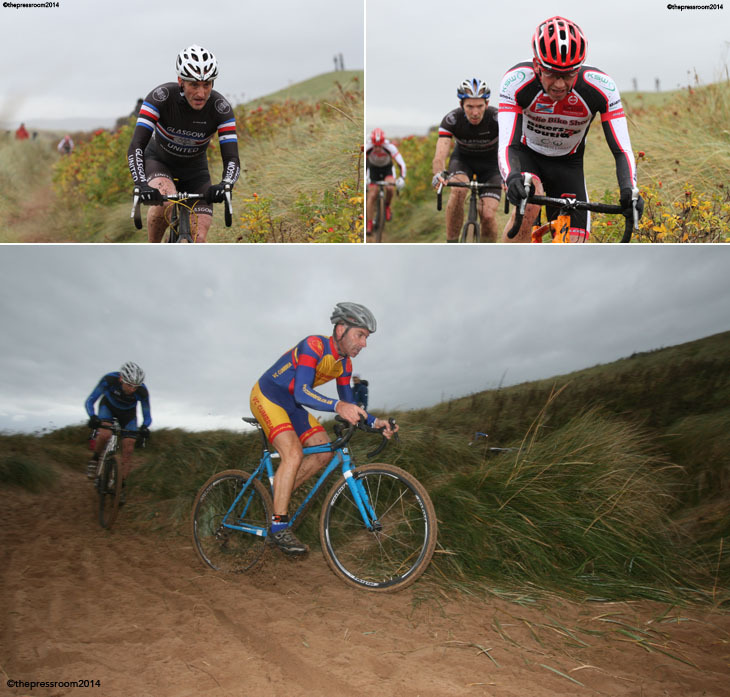 The Veteran Fifty Class again saw Brenden Roe (Leslie Bikeshop/Bikers Boutique) put the boot in early on, and he gapped the 30-strong grid to fight among the dunes and along the headland for the final poduim places. 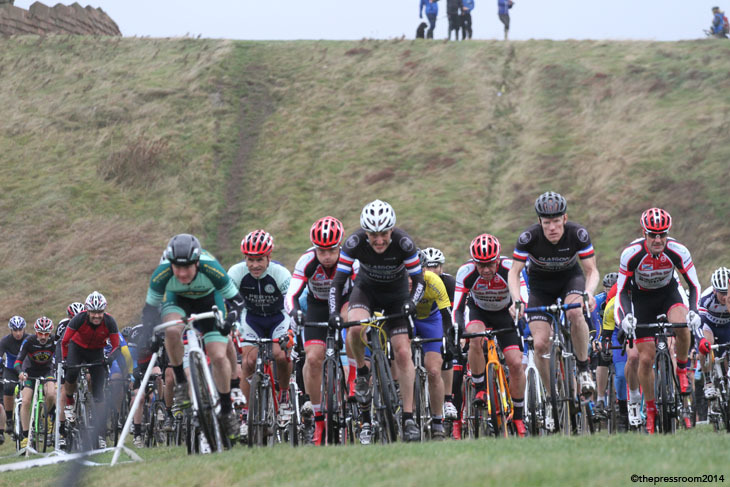 Roe who is never content just racing the Veterans was soon keeping the best Juniors honest in the shape of West Lothian Clarion's Jamie Mason and Fifer Conor Nally (Hardie Bikes). Mason more than did himself justice taking his Junior first win of the year, along with Roe who has now a trio of victories to show for his efforts. The very harsh nature of the race meant that there would be plenty of last gasp lunging and diving to the line as riders circulated together for much of the race, sussing out weakness and sucking in the sea haar. Closest podium of the day went to Graham McGarrity (Dooleys) who swooped in ahead of Bill Young (Leslie Bikeshop/Bikers Boutique) to grab second Veteran on the day. 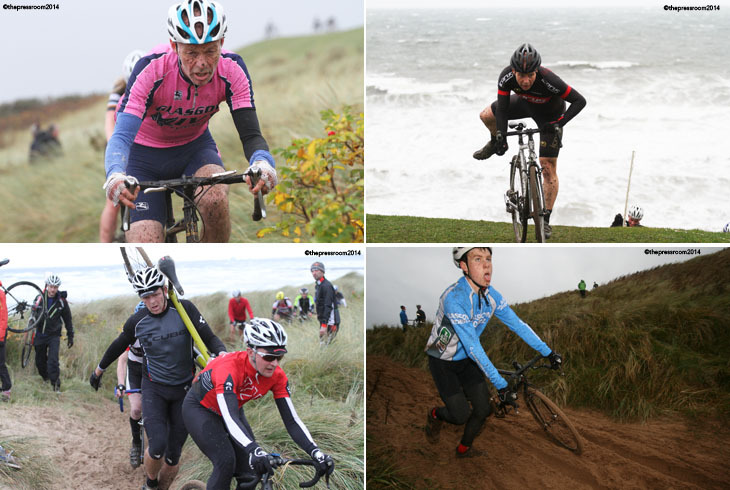 The hardy Women of Scottish Cyclocross who were in and out of the sand parcour with the men, often had to work hard to avoid the traffic and try and set a race up for themselves. Anne Ewing (WV Breda), who admits that she doesn't like technical courses, was riding gamely with Isla Short (Team Thomsons) at the helm of the race with erstwhile stand-in commentator Maddie Robinson (VC Moulin) unable to bridge over to the duo, who played it tough in the ruts and climbs. Short was able to dispense with Ewing by race-end with Robinson a solid third. 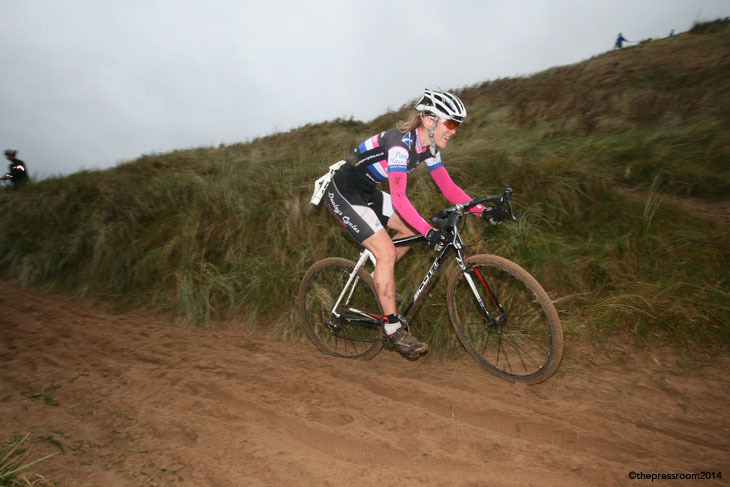 The Veteran Women class continues to hold no fear for Sian Tovey (Dooleys Cycles) who racked up her third win on the bounce from a very impressive ride from local Walkers racer Lorna Sloan. Winning races and being at the top of the heap meant little to Isla on the day however, as she dedicated her win to the unfortunate passing of one of East Kilbride Road Clubs finest, John Gordon. I am sure all of you reading this will join in offering heartfelt condolences to the Gordon family at this time. Let's show our respect to John's memory in the best way possible…by turning out in droves for the mudfest that is the 'Shan on Sunday. With more bad weather forecast for the weekend the mudslide is sure to be packed with on-lookers hoping for some out-of-control sliding action. Before that, we have the ghouls and ghosts of Hallocross on Friday evening at Dalkeith. With a prize list as long as Jimmy Mach's arm there'll be hot, scary competition through the woods of Midlothian.